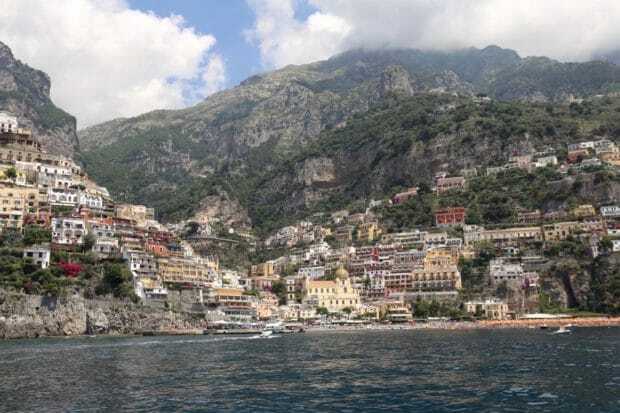 Among the glittering string of coastal gems, legendary Positano and Amalfi sparkle the brightest, while mountaintop Ravello has the glossy fame of its grandiose villas and Wagnerian connection. Aside from its sheer beauty, the region is home to some superb restaurants and hotels. It is also one of Italy’s top spots for hiking, with well-marked trails providing a great means of getting away from the coastal clamour. 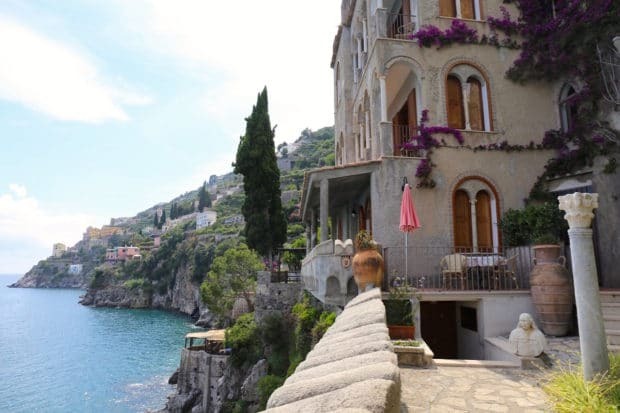 Villa Scarpariello Relais is a historic castle built on a jaw-dropping sea cliff. The Tower of Scarpariello was built in 1533 by the University of Ravello and commissioned by the Viceroy Don Pedro of Toledo as part of the coastal fortifications for the Amalfi dukedom against the invasion of Turkish pirates. This noble and enchanting aristocrat’s residence is situated in Marmorata di Ravello, one of the most exclusive and panoramic towns along the Amalfi Coast. The property features eleven sea view accommodations, surrounded by lemon and fig trees with scented gardens, gorgeous terraces for lounging in the sun and a salt water swimming pool nestled in the rocks. Fun Fact: Jackie Kennedy enjoyed a summer holiday here in August 1962 with her daughter Caroline. Hotel Santa Caterina is a late 19th century liberty style villa immersed in the beautiful scenery of the Amalfi Coast, an elegant seaside residence surrounded by the perennial blue of the Mediterranean sea and sky, by luscious bougainvillea and by lovingly cultivated olive groves and fruit orchards. 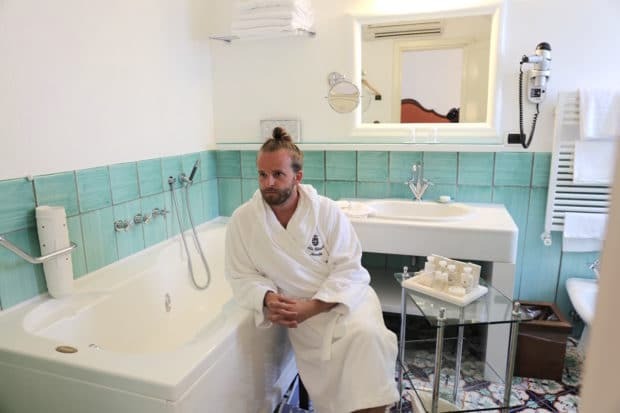 A member of Leading Hotels of the World, this luxurious boutique property features an elegant spa which is a must visit for any tourist who have tackled Amalfi’s endless staircases and steps. Here guests indulge in a fabulous range of face and body treatments, performed using essences of Mediterranean herbs and citrus which leave the body feeling pretty and pampered. Book yourself the spa’s signature Lemon Massage, a locally inspired aromatherapy treatment featuring slick lemon oil and juicy lemon slices. Atrani is a petite picturesque town located a stones throw from Amalfi to the east. It’s winding roads and perched cathedral are so postcard perfect that in 2012 Fiat used the tiny town as the backdrop for its new commercial. 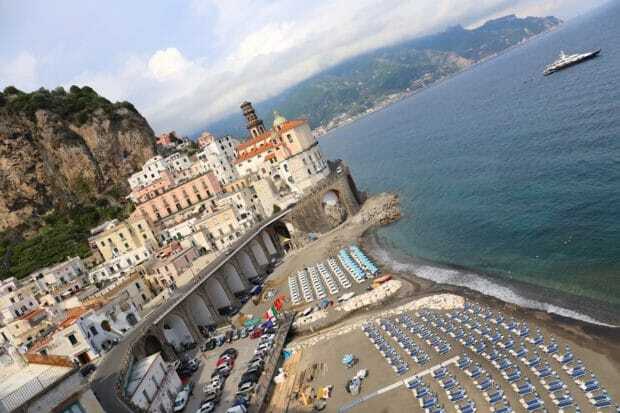 Atrani is far less busy than Amalfi, its beach filled with luxurious beach chairs, a perfect spot to sip through a refreshing glass of rose while staring out at the millionaire yacht’s that bob along the horizon. Amalfi Cathedral is a 9th-century Roman Catholic beauty located in the sun-splashed Piazza del Duomo. The Cathedral’s long staircase spills onto this bustling piazza making it the regions hub for tourist activity as visitors tip toe through the Cathedral, sit on spacious cobblestone streets sipping pints of Peroni or lick their hands from the trails of gelato melting down from their colourful cones. The Amalfi Cathedral is dedicated to Saint Andrew, whose remains were reportedly brought to Amalfi from Constantinople in 1206 during the Fourth Crusade by Cardinal Peter of Capua. In 1208, the crypt was completed and the relics were turned over to the church. Predominantly of Arab-Norman architectural style, the cathedral has been remodelled several times, adding Romanesque, Byzantine, Gothic and Baroque elements. 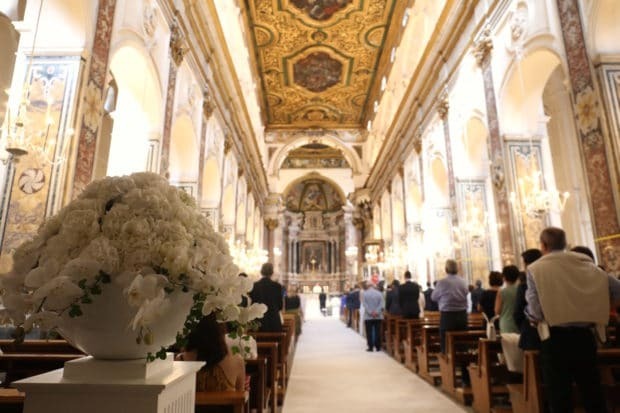 Highlights of the interior include a wooden 13th century Crucifix which hangs in the liturgical area and a painting above the alter by Andrea dell’Asta of The Martyrdom of St. Andrew. Located in the mountains above Amalfi, the views from the tiny town of Pontone are simply splendid. The hike to get way up there is a rigorous one which should only be attempted by able bodied folks. It took me an hour to hike up thousands of stone steps before collapsing in the towns wee piazza to catch my breath. Fitness fans will adore the exercise while enjoying jaw-dropping mountain valley panoramas. Hearing the sound of gravel crunching under your feet and the occasional call of a bird echoing through the valley offers a quiet calm for the hungry-for-lunch crowd racing to get to the top. Once you’ve caught your breath head to local favourite Antico Borgo for a glass of cool white wine, a few fork twirls of hand-rolled pasta and a pretty plate of butter and lemon doused veal scallopini. The views from the restaurants patio are unforgettable, surrounded by the fragrant perfume of lemon tree’s which sway lightly in the breeze on ancient terraces. 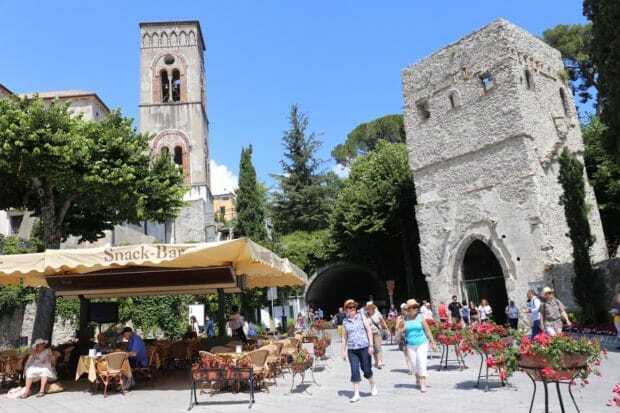 The magnetic beauty of Ravello probably has to do with its many exhilarating contrasts, both visual and cultural. Built boldly on a rocky spur, seperating the Valle del Dragone from the Valle di Maiori, this remarkable city is suspended 350m directly above the azure and turquoise sea of the Gulf of Salerno. 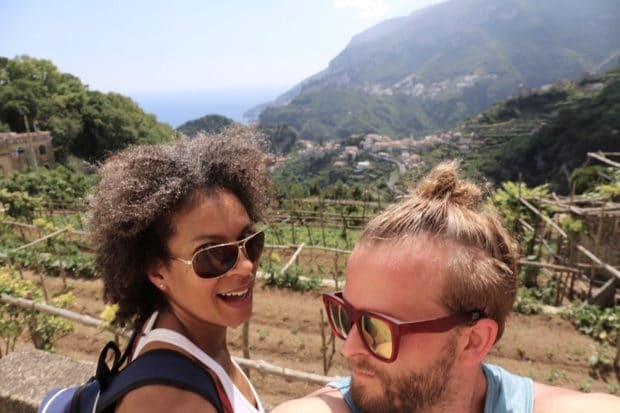 From here you can take in the entire Amalfi Coast and its famously picturesque towns in one sweeping glance – and remain transfixed indefinitely by the thoughts of infinity such an awesome view conjures up. A wide range of poetic and artistic souls have taken one look at the place and decided to stay; among the former residents are Boccaccio, Wagner, Grieg, Greta Garbo, Leopold Stokowski and Gore Vidal. 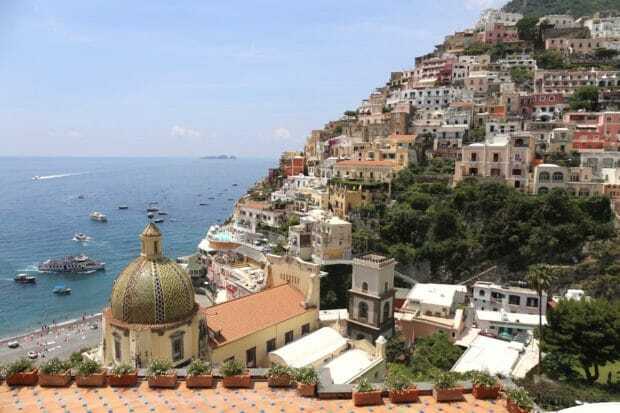 Positano is the coast’s most picturesque and photogenic town, with vertiginous houses tumbling down to the sea in a cascade of sun-bleached peach, pink and terracotta colours. No less colourful are its steep streets and steps lined with wisteria-draped hotels, smart restaurants and fashionable boutiques. Look beyond the facades and the fashion, however, and you will find reassuring signs of everyday reality: crumbling stucco, streaked paintwork and even, on occasion, a faint whiff of drains. There’s still a southern-Italian holiday feel about the place, with sunbathers eating pizza on the beach, kids pestering parents for gelati and chic women from Milan checking out the boutiques. The fashionista history runs deep – moda Positano was born here in the ’60s and the town was the first in Italy to import bikinis from France! Arrive on the local ferry so you can enjoy the scenic approach and gawk at the luxurious yachts that park themselves a stones throw from the beach. Perfectly situated on a hill between the craggy cliff tops and the glinting Mediterranean Sea, Hotel Villa Franca is romantic Italy at its most ravishing. With the picturesque cobbled piazzas of Positano and two blissful beaches just steps away, this stylish hilltop retreat offers the chance to check out from reality and absorb the glamor and gorgeousness of the ever-enchanting Amalfi Coast. A member of Small Luxury Hotels of the World, Hotel Villa Franca’s intimate rooftop is the place to enjoy lunch while perched over Positano. Li Galli Grill is set on a terrace high above the sea offering hungry tan-fans spectacular views while dinning on sophisticated cuisine which celebrates the regions prized ingredients. Sip Aperol Spritz with a smile over a leisurely lunch featuring pillow-soft gnocchi, creamy buffalo mozzarella in classic Caprese and plate of barbecued seafood caught fresh from the sea. Le Sirenuse opened in 1951, when four Neapolitan brothers turned their summer house in Positano into a charming hotel. Today the 58-room resort is considered one of Italy’s leading seaside luxury hotels, though it still retains the intimate, cultured atmosphere of a private home. 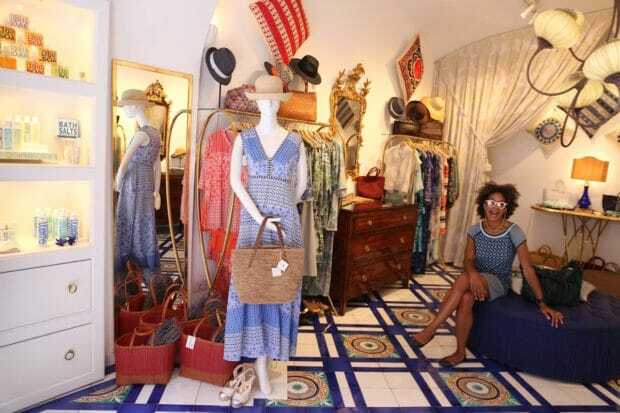 This is Amalfi’s A-Lister hot spot which has played home sweet home in the past to celebrities such as Sienna Miller, Reese Witherspoon and Anne Hathaway. Pop by the hotel’s boutique Emporio Sirenuse to shop men’s and women’s swimwear and resort collections. Other items include a series of hand embroidered throw pillows inspired by Central Asian textile motifs, glamorous sunglasses, and signature fragrance and skincare line Eau d’Italie. 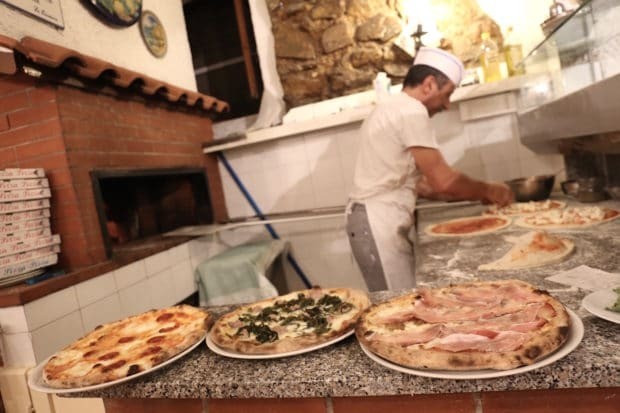 The best pizza in Italy can be found in nearby Naples so it’s perhaps not a shock that the pretty pies served along the coast are some of the best in the country. Walk to the less touristy town of Minori (just east of Atrani) and plop yourself on the petite patio at La Botte. I stood directly across from the open concept pizza station, drooling as one very focussed pie master tossed around dough, slopped fresh tomato sauce, twirled chunks of plump mozzarella and adorned each pie with spicy sausage, fragrant olives and bright green rapini. Your perfectly crispy pie is best enjoyed with a cool pint of Peroni!